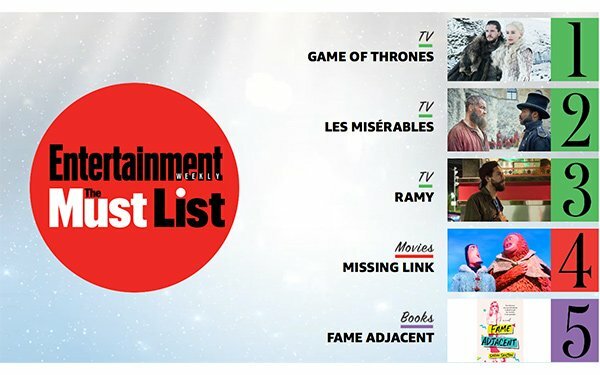 'Entertainment Weekly' Launches New Alexa Skill, Personalizes "The Must List"
Users gain instant access to expanded content, including interviews, fun facts and added insight about movies, TV, music and books that appear on the "Must List." They also get interactive elements, such as pop-culture trivia and a “Would You Rather” mini-game unlocked by listening. Krochmal added the new platform offers ample opportunities to incorporate content around pop-culture phenomena. like the premiere of the final season of HBO's "Game of Thrones" this weekend. "Thrones" fans can try “Dragon Eggs,” what the themed Easter eggs are called, once the secret built-in pass-phrases are unlocked. EW’s skill is the third created by a Meredith brand in collaboration with its Innovation Group — All Recipes and Health have also launched skills. Amazon reported selling 1 million Alexa-enabled devices in 2018. The launch coincides with a new Instagram Stories version of the “Must List,” which will include a bid for “Fan’s Choice,” allowing followers to vote for items they felt were missing from the list that week. The winner will be announced on the platform the following week. Krochmal added the Instagram adapted list will feature visual and audio extras; those with a screen-enabled Alexa device will have access to a special visual component. The Alexa and Instagram adapted “Must Lists” will remain active for the course of an issue’s newsstand life — generally one week, but two for special issues. The new Alexa skill will be promoted across Twitter, Instagram, digital properties and in the print magazine, where Krochmal anticipates the prompt will appear for a while as part of the “Must List” layout.